The Yamaha CP73 is a digital piano that redefines the live performance experience, with tons of performance-friendly features under the hood.. The Yamaha CP73 is a digital piano that redefines the live performance experience, with tons of performance-friendly features under the hood. With a comprehensive selection of world-class Grand Piano, Electric Piano, Organ, Orchestral and Synthesizer sounds, the Yamaha CP73 is your new go-to keyboard for almost any live performance situation. The CP73 features a huge array of legendary grand pianos under the hood, all sampled and re-modelled with painstaking attention to detail. 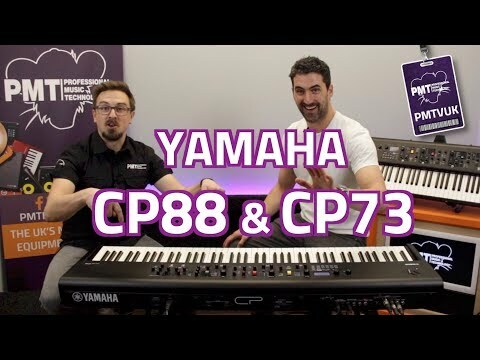 CP73 includes the Yamaha CFX, U1, SU7, CP80, 76 RD, Bosendorfer, S700 plus many more Piano models. Courtesy of its USB audio interface, the CP73's onboard Pianos can be continually updated with the latest content from Yamaha and the worldwide community, or why not design an arsenal of custom presets that suit your signature sound? With 160 Live Set sounds, each overwritable with your own modifications, there's more than enough to cover every mood, genre and timbre. With innovation powered by Yamaha's unrivalled Piano tradition, the new CP Series Pianos set a new benchmark for what a live stage keyboard should offer as standard. Say hello to a new industry standard! The Yamaha CP73 employs a brand new Yamaha BHS Keybed that offers balanced Hammer Action, and features matte black keytops for an authentic piano touch. When playing music, the feel of an instrument has a strong bearing on the musician’s performance. Yamaha CP series stage pianos feature finely tuned keys for every use. CP73 employs balanced hammer action with an equal key feel across the spectrum, granting keyboardists perfect control over their tone regardless of sound choice. Yamaha Digital Pianos are highly revered for their playability, and their experience and heritage from top-of-the-line Grand Pianos trickles down into the new CP Series keybeds. Whether it's Acoustic, electric or synthetic, the new CP Series always provides the perfect sound. Yamaha stage pianos traditionally stand out for their comprehensive selection of flexible, high-quality sounds. Classical pianists rejoice in the sampled reproductions of two outstanding, world-renowned grand pianos, among others: Yamaha CFX and Bösendorfer Imperial. A Yamaha U1 upright piano is part of the library, too. Keyboardists find legendary electric piano sounds, ready to enhance every performance. Digital effects like wah-wah or phaser allow for further customisation the sounds. This extensive library is augmented by synthesizer sounds to achieve even more flexibility for live gigs. The Yamaha CP73 features one knob settings that allow you to fine tune synth parameters with one touch. Yamaha's focus on an intuitive, hassle-free live performance workflow is evident in the control pattern, linking every element on the instrument’s surface to exactly one function under the hood. There is no navigating of menus and submenus, every function can be controlled directly – a great advantage when adjustments need to be made quickly, reliably and intuitively in hectic live situations. Seamless Sound Switching allows for changing to a different sound while played notes still fade out. A song’s final chord can still slowly ebb away, while the sound required for the next song is already loaded up. Just one of many new additions to the CP series that lend it perfectly for the live stage! The Yamaha CP73 has been designed primarily for touring musicians and keyboard players that gig on the road. Weighing in at only 13kg, its manageable to travel with. An official yamaha CP73 Soft Case is available separately!